This is the original edition of Jayaveda’s pastoral poem, the Gitagovinda, celebrating the loves of Krishna and Radha. 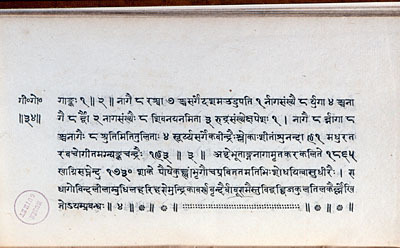 The oblong-format work, consisting of 36 folios, is printed on paper in seven lines of Nagari script per page, and the foliation is indicated in the left-hand margin on the back of each page. The volume features an ornamental snow-crystal motif that crops up throughout the text, a characteristic device used by the Indian publisher Baburam. This edition was printed in Calcutta in 1808, in imitation of manuscripts. The present-day binding, made in the museum in 1991, is an extremely faithful reproduction of the book’s original appearance.